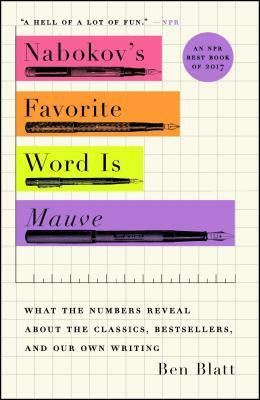 Data meets literature in this “enlightening” (The Wall Street Journal), “brilliant” (The Boston Globe), “Nate Silver-esque” (O, The Oprah Magazine) look at what the numbers have to say about our favorite authors and their masterpieces. Ben Blatt is a former staff writer for Slate and The Harvard Lampoon who has taken his fun approach to data journalism to topics such as Seinfeld, mapmaking, The Beatles, and Jeopardy! He is the author of Nabokov’s Favorite Word Is Mauve and, with Eric Brewster, the coauthor of I Don’t Care if We Never Get Back, which follows the duo’s quest to go on the mathematically optimal baseball road trip, traveling 20,000 miles to a game in all thirty ballparks in thirty days without planes. Blatt’s work has also been published in The Wall Street Journal, The Boston Globe, and Deadspin.